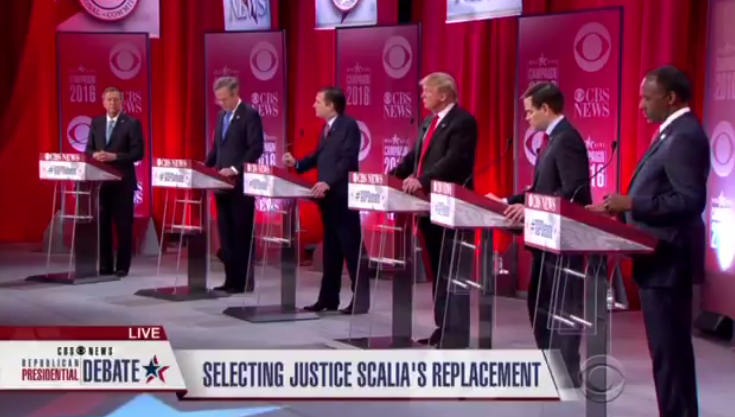 Shortly after taking a moment of silence to commemorate the late U.S. Supreme Court Justice Antonin Scalia during Saturday night’s CBS Republican presidential debate, candidates were asked whether President Obama should be the one to nominate Scalia's successor. In agreement with his fellow contenders, Florida Sen. Marco Rubio argued that Obama should let the country focus on the current election and allow the next president to select a replacement. “It’s been over 80 years since a lame duck president has appointed a Supreme Court justice,” Rubio argued. Cruz added that, if elected to the Oval Office, he plans to nominate a "confirmed principled Constitutionalist" to the Supreme Court. Check out the candidates' remarks below.